Volunteer on Move In Day! Did you know that we move over 7,000 students into residence at UBC before school starts in September? That’s a lot of people! And we need a ton of volunteers to welcome them to campus, help them find their way, and help them move their stuff. There are two Move In Days that we need your help for. You can sign up for shifts on one or both days! Plus, move into residence early – Friday, August 31 – if you’re returning to live in residence. 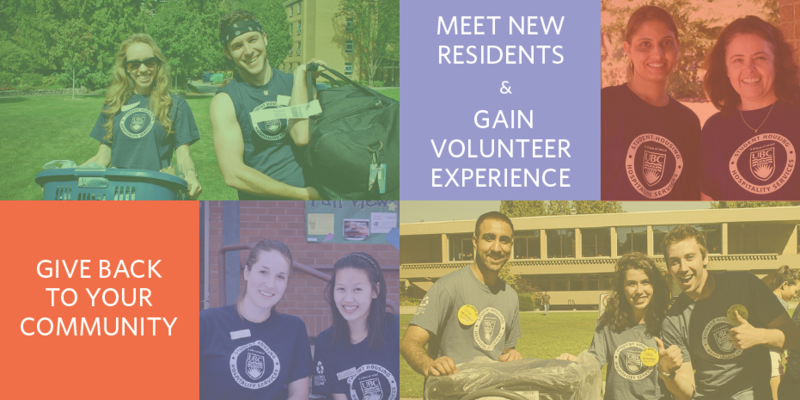 And, of course, an amazing opportunity to meet new friends, reunite with old ones, and provide a warm, fun, and smooth move-in experience for incoming UBC residents and families. Email us if you have any questions. We look forward to seeing you on Move In Day!